Beyer Carpet Cleaning believes in offering a fair price for our services so don’t miss out on our fall specials and discounts. This fall we are rolling out out Diamond Package fall specials on carpet cleaning. 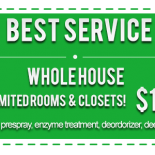 This pack not only includes our whole house best service but it also include carpet sealant in all your rooms, speed dry, and odorcide. This Diamond package normally runs at $300 but for our fall special we are discounting to $249. It’s the best deal out there! Our fall specials carpet sealant will protect your carpets for approximately 10 months. If you have any spills all you’ll have to do it blot the stain with a dry rag or towel and then vacuum the area and no stains should appear or set in to your carpet. Also included in this fall special is our speed dry. This is a powerful industrial air fan that will dry your carpets as we clean. Once we leave your home your carpets will dry with 1 to 2 hours instead of 6 to 7 hours then there is our odorcide. You are probably wondering what odorcide is but I will tell you. Odorcide is our odor eliminator. If you have pet odor, a musky odor, cigarette odor, or pretty much any odor our product will rid your carpet of the smell and will once again smell great!. You get a lot for your money when you order the Diamond package from Beyer Carpet Cleaning. Most reputable companies will charge twice the amount or more in order for you to receive all of these services. Just for a whole house they will charge somewhere near $200 and we only charge $139. Our discounts are unbeatable. If someone says they can beat our price or our fall specials they are usually hiding something from you or you will receive a service that was not all what you expected. Beyer Carpet Cleaning has no hidden fees and what we say we charge is what we actually charge. If we say we are going to provide a service it will be exactly what you thought it would be. Don’t be fooled into hiring someone like Stanley Steamers or Sears who are big names but will charge you more than what you want to spend.